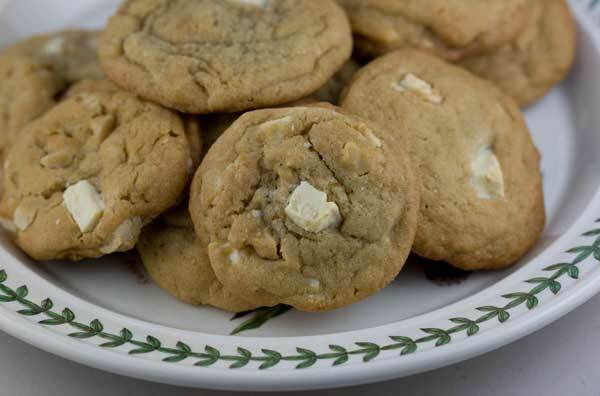 I used to call these White Chocolate Macadamia Nut Cookies, but I made them for a friend named Edward and he now requests them all the time! The new name is in honor of Edward. Beat butter, shortening and both sugars with an electric mixer until creamy. Add eggs and extracts and beat for about 30 seconds. Scrape sides of bowl and beat in salt and baking soda. Add flour and stir until it is almost mixed in, then stir in macadamia nuts and white chocolate. Drop heaping tablespoons of dough on a foil lined plate or baking sheet and chill for about an hour. Preheat oven to 350 degrees F (176 C). Line a couple of cookie sheets with parchment paper or regular foil. Arrange dough pieces 2 1/2 inches apart on baking sheets. Bake for 12-15 minute or until edges are brown and cookies are slightly golden. Cool on cookie sheets for about 5 minutes, then transfer to wire racks. If you don't have a scale, stir or sift the flour well before using. For the shortening, I've had good luck using Nutiva non-hydrogenated, but you can use Crisco or whatever type you prefer. I like to use a little less egg, but since I don't usually have medium size eggs, I use the equivalent. I crack two eggs into a cup, beat them with a fork, and weigh out 90 grams.